For many people living with severe or debilitating health conditions, a caregiver is needed to provide assistance with regular activities of daily living. These include walking, bathing, getting dressed, cleaning, preparing food, shopping, and numerous other daily tasks that many of us take for granted. Another critical responsibility of caregivers is helping patients take their medications, whether that means keeping a schedule of when pills should be taken or actually administering injections. Oftentimes, caregivers of patients with serious health conditions that qualify them for a medical marijuana license will also register themselves as the designated caregiver under the Compassionate Use of Medical Cannabis Pilot Program Act. This allows them to visit medical marijuana dispensaries on the patient’s behalf so they get the natural treatment they need without having to leave the house. This is especially beneficial for hospice caregivers and caregivers for the severely disabled, as these patients are often bed-ridden or prefer to stay at home. 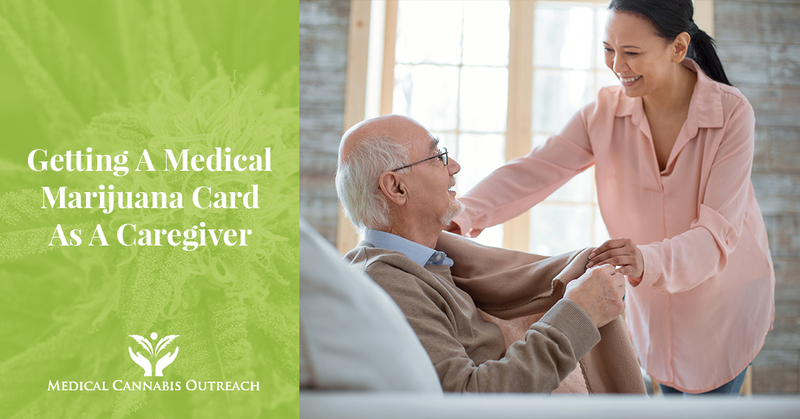 Fortunately, the Medical Cannabis Patient Registry Program makes it easy for caregivers to apply for a medical cannabis card on their patient’s behalf, so long as they provide the required paperwork and abide by the state and federal laws. Here’s what you need to know about getting a medical marijuana license as a caregiver in the state of Illinois. Given that caregivers are only allowed to seek medical marijuana treatment for their patients and cannot consume any themselves, they should bring the patient with them to the clinic when they fill out the Application for a Designated Caregiver Registry Identification Card. The process of applying for a medical marijuana card as a caregiver entails adding that caregiver to the patient’s registry, so be ready to provide your state-issued ID and proof of residency upon arrival at your chosen medical cannabis clinic. From there, one of our friendly team members will guide you through the application process, from filling out the required paperwork and having your photo taken for the medical card to paying the mandated state fee. For caregivers registered under the program, the medical card application fee is $25 for a one-year registry card, $50 for two years, and $75 for three years. The cost of applying separately for a medical cannabis patient who has already been registered under the Medical Cannabis Pilot Program is $75, with the expiration date remaining the same as that of the patient. The application fee for the designated caregiver should be in the form of a check or money order payable to the Illinois Department of Public Health, and this fee is non-refundable under any circumstances. Now that you know more about the process of applying for a medical marijuana license as a caregiver, it’s time to schedule your appointment at a medical cannabis clinic near you. There are seven Medical Cannabis Outreach locations throughout the state of Illinois for your convenience, including medical cannabis clinics in Savoy, Pekin, Chicago, and many other cities. We also provide mobile wellness clinics and regularly host educational seminars, so be sure to follow us on social media to learn about upcoming events in your area. It is our mission to help local caregivers provide their patients with the natural treatment they need to manage the pain and symptoms of severe or debilitating health conditions. Thank you for choosing Medical Cannabis Outreach as your preferred medical marijuana clinic in Illinois — we look forward to helping you serve your patient under the Medical Cannabis Pilot Program!